In Orario, fearless adventurers band together in search of fame and fortune within the underground labyrinth known as the Dungeon. But Bell Cranel, novice adventurer, has bigger plans than riches and glory; he fights monsters in the hope of having a fateful encounter with a girl. When this happens, it doesn’t go exactly as he planned. Thus begins the story of an unlikely pair, a boy and a goddess, both trying to prove themselves, both eager to reach their goals. “Save a female adventurer from a monster, and you get to know each other.” That’s roughly what his grandfather said. Bell Cranel’s only problem is that she saved him. Desperate to support Bell despite her jealousy, Hestia pleads with another, more powerful goddess to make him a weapon that will keep up with his rapid growth. With the monster in pursuit, Bell begins to question if he is strong enough to defeat it. But Hestia won’t let him give up that easily. Bell’s dungeon adviser, Eina, recommends that he buy new gear and find a supporter. Yet when a supporter shows up, she’s a bit more than she appears. 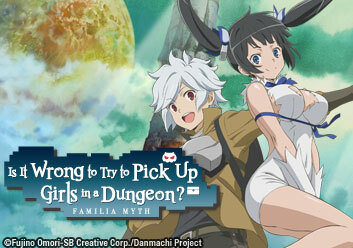 Bell is advancing in the dungeon with Lili’s help, and he just keeps growing! After reading a book left at the tavern, he gets more than he bargained for. Lili pressures Bell further into the dungeon, but those who care for Bell are concerned about how trustworthy Lili is. With Lili’s aid, Bell descends deeper into the Dungeon. Still worried about his lack of strength, he’s surprised when he’s offered training by the most unexpected person. Once more a Minotaur is where it doesn’t belong. This time, Bell won’t accept being saved like before. With lives on the line, Bell will have to decide to become a hero. Bell’s success has landed him a place in history as the fastest ever to level up! While looking for new armor, he finds a unique and powerful new ally. The middle floors are tougher than Bell dreamed. A desperate party rushes past them and the monsters following them focus their attention on Bell and his comrades! Bell’s party struggles to reach the 18th floor, a safe zone. After what they’ve been through, the sanctuary of what adventurers call "Under Resort" will be a welcome respite. An adventurer must always be on guard; though even the monsters rest on the 18th floor, the dungeon isn’t the only breeding ground for enemies. Just when the adventurers think they know the dungeon, it proves that it has a mind of its own; a floor boss appears out of nowhere.